Urgent: Mobilize International Workers Protest! Parents of arrested UNAM student strikers confront police February 6 demanding their children be released. Free the Mexican Student Strikers Now! Drop the Charges! Mexican Army Out of Chiapas and the UNAM! Mobilize Working-Class Power Against Repression and Privatization! February 8, 12 noon – This morning 579 of the 745 student strikers and others arrested on February 6 were released "bajo reserva de ley," meaning that charges have not been dropped and the federal attorney general's office "reserves the right" to rearrest them at any time. Among those released were the several arrested comrades of the Grupo Internacionalista. The hundreds of strikers were held in various government facilities, including in a parking lot in downtown Mexico City where they were exposed to the winter cold. Meanwhile, on the first night over 10,000 parents and supporters of the arrested students angrily protested in the Plaza of the Constitution. Yesterday the uproar over the mass arrests and police occupation of the National University continued to grow, both in Mexico and internationally. A number of unions issued urgent protests, including ASTTEL telephone workers in El Salvador and the West Coast longshore and warehouse union ILWU in the United States. The Mexican government's sudden action this morning was clearly in response to the huge outcry its police measures provoked. As late as 4 a.m. today detainees were being prepared for transport to prison. Hundreds of students are still being held by the Mexican government, including all of the 251 arrested on February 1 and 70 students from the rural teacher training institute of El Mexe in the state of Hidalgo. Some 230 student strikers in the Reclusorio Norte prison in the capital have gone on a hunger strike demanding an end to the cop occupation of the National University and the National Institute of Anthropology, as well as the witchhunt against strikers not yet arrested. Yesterday police picked up a professor at his house, a student activist leaving a TV interview and others on the street, while cops searched some homes of arrested strike leaders. This afternoon a march on the Secretaría de Gobernación (interior ministry) has been called by the union of National University workers (STUNAM), some 37 of whose members were arrested in the police round-up. Now the bourgeois "opposition" Party of the Democratic Revolution (PRD) of Cuauhtémoc Cárdenas is trying to cover its dirty role in repressing the student strikers by joining the clamor for their release. It is urgently necessary to mobilize the power of the working class independent of the capitalists, their parties and their state to fight the continuing police-state repression. Beginning shortly after 6 a.m., this morning, February 6, more than 2,500 troops of Mexico’s Federal Police (PFP) invaded the main campus of the National University (UNAM) and seized hundreds of student strikers. Backing up the militarized national police were some 500 Federal District (Mexico City) riot police, while police and army helicopters circled overhead. This sinister assault on the strikers organized in the Strike General Council (CGH), who have held out for nearly ten months in the barricaded campus, must be fought with an outpouring of international protest, particularly mobilizing the power of the workers movement. The arrested CGH supporters were packed onto more than a dozen buses and into black Suburban police vans. Parents of the students rushed to the Ciudad Universitaria campus, and several were arrested as they tried to block the buses from leaving. At present (3 p.m., Mexico City time) more than 400 family members and supporters of the students are gathered outside the federal attorney’s offices in Azcapotzalco, where many strikers are being held, while hundreds more are protesting the arrests outside the headquarters of the federal attorney’s office in downtown Mexico City, where 173 strikers are being held. A march has been called this evening heading to the Zócalo, the capital’s main square. Today, with close to 1,000 Mexican student strikers in jail and facing years in prison, we issue an urgent call for international working-class protest. The students face charges of “criminal association” and “plundering” the UNAM. In addition, 430 arrest orders were secretly issued for individual strikers. Another 251 striking students are already in jail, having been seized by the PFP February 1 in a violent cop assault on the Preparatoria 3 junior college. Most have been charged with “terrorism,” and the government has refused to release any on bail. Following the dawn attack on the UNAM, the federal attorney general grotesquely declared that his aim was to facilitate “dialogue” and the “rule of reason.” He also cynically said the cop assault was in order to “safeguard” the National University, like U.S. imperialists bombed Vietnamese villages in order to “save” them from Communism! Dozens more students are facing up to 40 years in jail on charges of “mutiny” for participating in a demonstration outside the U.S. embassy last December 11 to defend protesters against the World Trade Organization arrested in Seattle and demand freedom for Mumia Abu-Jamal, the former Black Panther and renowned radical journalist on death row in Pennsylvania. A big banner demanding Jamal’s freedom hangs from the Faculty of Medicine in Ciudad Universitaria. Several supporters of the Grupo Internacionalista, section of the League for the Fourth International (LFI), are among those arrested. The GI has called since the beginning of the strike for it to be extended to university workers and key sectors of the labor movement, notably electrical workers. Last summer, the GI was instrumental in sparking the formation of workers defense guards that defended UNAM installations against threatened police-army attack. In recent days, the GI has highlighted the call for working-class mobilization against the mounting anti-strike repression. UNAM, the largest university in Latin America with over 270,000 students and 100,000 employees, has been stuck for 291 days by students demanding free higher public education. The university administration, headed first by Rector Francisco Barnés de Castro and after his resignation in November by Juan Ramón de la Fuente, refused to grant the students’ six-point list of demands. Instead, the authorities tried to undercut the strike by “suspending” the drastic fee increase that sparked the strike, leaving the way open to reimpose it after protest died down. Both Barnés and De la Fuente are former top federal government officials who were in charge of privatizing state-owned industries, the first in the petrochemical industry and the second in the public health system. In addition, as the cabinet member in charge of health De la Fuente presided over a program of forced sterilization of Indian women in the state of Guerrero, a region of extensive peasant and guerrilla struggles. To give a cover for the police-state crackdown, De la Fuente organized a plebiscite, a favorite pseudo-democratic device of bonapartist dictators. This referendum for repression was also supported by the bourgeois-nationalist “opposition” party, the PRD (Party of the Democratic Revolution) of Cuauhtémoc Cárdenas and by so-called “moderate” student leaders linked to the PRD. With this “mandate,” hardliners in the PRI (Institutional Revolutionary Party), which has governed Mexico uninterruptedly for more than 70 years, called for sending in the police. A parade of bishops and other Catholic church officials chimed in. The UNAM strikers’ fight for open admissions is not just a local struggle but confronts plans designed by the International Monetary Fund and the World Bank to privatize large segments of public education in Latin America and elsewhere. 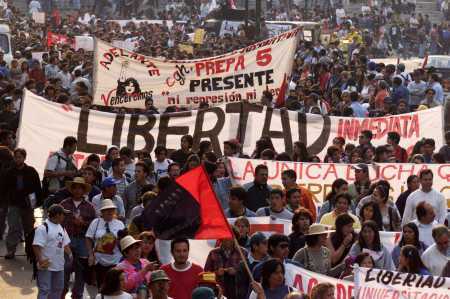 The Mexican government had agreed to impose tuition at UNAM in 1999 in exchange for a loan from the World Bank. While claiming it has to impose tuition that would exclude tens of thousands of poor and working-class students from the National University, the government is pouring close to $90 billion into bailing out bankrupt privatized banks, more than 100 times the entire UNAM budget. anti-strike repression and the rector's ultimatum. The attack on Mexico’s poor and working people is not limited to the UNAM strike. Already on the agenda is the government’s attempt to privatize the electrical energy industry, which has provoked mass marches by tens of thousands of electrical workers. The SME electrical workers union has supported the UNAM students’ struggle for free public higher education, including sending several hundred union members to participate in worker-student defense guards when a government attack was threatened last July. SME workers are presently in contract negotiations, and many have children among the arrested student strikers. The electrical workers must bring to bear their tremendous power to combat the repression. The National University workers union (STUNAM) is also directly affected by the repression. While STUNAM financially supported the strike and university workers participated in defense guards, the union did not join the strike. In addition, the Auxilio UNAM campus cops (including some who participated in the police provocation at Prepa 3) are in the union. Cops are not workers but repressors for capital. The Grupo Internacionalista has called on the STUNAM to throw Auxilio UNAM out of the union, and a resolution introduced by the GI urging the union to do so was passed by the CGH last week. During almost ten months on strike, the students have faced brutal repression both by police of the federal government of President Ernesto Zedillo’s PRI and by the granadero riot police of the Mexico City government controlled by Cárdenas’ PRD. The Grupo Internacionalista has emphasized the danger posed by the “popular front” of class collaboration around Cárdenas and his PRD, which ties the workers and oppressed to a section of the capitalists. The urgency of this warning is underlined by the recent events, in which all the bourgeois parties have students’ blood on their hands. The GI fights to break the working class from the Cárdenas popular front and to forge a revolutionary workers party. The Mexican government’s plans to privatize and restrict university education to a well-off elite are part of a broad offensive against the working people and poor. Last week, President Zedillo declared to the bankers and capitalist politicians assembled in Davos, Switzerland that the Zapatista Indian uprising in the southern state of Chiapas was nothing but a historical “detail,” and there was no point in further “dialogue” with the EZLN rebels. De la Fuente, in turn, tried to whip up anti-strike frenzy by charging that leftist guerrillas were involved in the UNAM strike. Now we get from Zedillo and his hand-picked rector Mexico’s capitalist rulers’ idea of “dialogue” – behind bars! The dramatic events in Mexico are part of a worldwide offensive by the capitalist rulers against the working people. The League for the Fourth International urgently calls on workers organizations, students and all who stand for democratic rights and defense of the oppressed to hold demonstrations and protest actions against the brutal assault on the Mexican student strikers. In New York City, we call to demonstrate on Monday, February 7, beginning at 4 p.m. outside the Mexican Consulate, 27 East 39th Street (between Park and Madison Avenues).